Earlier this year, Pokemon GO took the world by storm. It clung to the top of the smartphone app charts for weeks. It outperformed such major titles as Clash of Clans in a matter of weeks. We even had multiple weeks of nothing but Pokemon Go news stories and ‘funny’ Pokemon spawnings flooding Twitter and other social networking sites! And well, with a mobile game becoming such a major phenomenon, it’s not a surprise that the entertainment world would capitalise on it. Which is exactly what the recent Doctor Who Christmas special actually did. 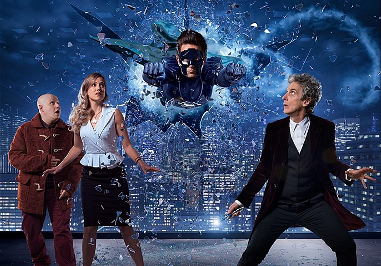 Titled ‘The Return of Doctor Mysterio’, the episode featured the doctor and a local superhero (called The Ghost) teaming up to stop brain swapping aliens called the Harmony Shoal. By say, exploring one of the aliens’ company headquarters in Tokyo. But they needed a distraction. So what did the Doctor do? Well, he ‘generated a bunch of Pokemon downstairs’ and capitalised on the Pokemon GO hype to clear out the building! Guess those Lapras and Snorlax nests really do get people racing to find them! Shows the BBC is at least a bit up to date with their video game references. Better than playing a bunch of Pac-Man sound anyway! But what do you think? Did you like this neat Nintendo reference in the recent Doctor Who Christmas special? How about the actual episode itself, with its goofy superhero themed storyline and the weird brain swapping antics? Post your thoughts on the matter at the Gaming Reinvented forums or on social media today!